SAKURA’S GUIDE TO EFFECTIVE SOFT BAITS RIGGING. Whether freshwater or sea, soft lures are increasingly used in France and around the World. Invented originally for Black bass fishing, they are now broken down in a multitude of shapes and sizes to be of interest to all kinds of predators. We offer you the most effective arrangements for soft lures that you can then adapt to the conditions encountered locally. We invite you to consult the flexible lure range Sakura, Yamamoto and Biwaa that should meet your needs as they are complete and complementary. TEXAS MOUNTING (Texas Rig) – basics. Originally from the USA and used mainly for fishing Black bass, this assembly allows you explore the most snaggy stations without getting hooked up. Although you can achieve with a single hook, it offers maximum efficiency with an off-center shaft hook (offset hook) specially designed for this. Today, the Texan mounting is used in sea and fresh water for all kinds of predators. Although you will over time adapt these basic principles, here’s how to set up the classic Texas rig. Further down you will discover the different variations around this method. 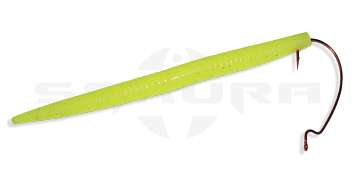 N°1 : prick the tip of the hook in the “nose” of the lure and exit after a few millimeters. On a lure having a different colours on the back and belly of the lure, exit the hook on the belly side. N°2 : sliding the hook through the lure until the lure reach the level of the eyelet for attaching the line. N°3 : rotate the hook so as to position its tip toward the back of the lure. N°4 : after spotting where the hook point will be positioned, push the hook point through the lure, observing proper alignment in the longitudinal axis. N°5 : Ensure the lure is straight and the hook point exposed. It’s ready ! The lure must not be stretched or coiled on the shaft to maintain its efficiency. Texan mounting style variations are distinguished by the fact that the system is weighted or not and that the weight is free to slide on the line or not. Weightless Rig: (rigging without weights) clean installation (hook – lure) to prospect the surface layers or get a natural action leaving a slowly sinking lure. Ideal for Senko Gary Yamamoto and Fat Ika, Slit Shad, Shad L16, L16 Koneel Sakura, Scorpitail Biwaa etc … Hooks Recommended: Gamakatsu Offset Worm W34 – W314 – W323 – EWG – W321. Texas Rig (Installation with weight): Mounting Texan whose basic sliding weight leaves a great freedom of swimming and cancels the resistance of the weight when the fish grabs the lure. Poorly suited, however, to highly snaggy items like trees and other dead wood piles. Hooks identical to Weightless Rig and lead or tungsten weights between 3.5 g to 14 g.
Texas Rig fixed : Variant whose weight is blocked by a Sinker Stopper Sakura positioned up the line. This arrangement allows the prospect of really dirty ground without snagging. It offers, in addition, a gain in precision when casting and penetration of the obstacle. Virtually all soft lures Gary Yamamoto Biwaa and Sakura suitable for this type of installation and the Texas Rig classic. There are also mounting Texan style variations on the degree of exposure of the tip of the hook. According to the ground you fish and the “greed” of the fish it is appropriate to adjust this setting to keep high efficiency of exploration and achievement of hooking. Full Texas Rig (original style) : For very snaggy stations, the point of the hook remains fully hidden in the body of the lure. Hooking up can be difficult so a delayed strong strike is required. Recommended Hooks: Gamakatsu Offset Worm W34 – W31. 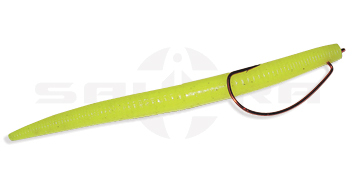 Tex-skinned Rig : The point of the hook through the body of the lure is then bedded slightly on the back of the lure. This arrangement allows to pass into obstacles not too thick while maintaining good hooking efficiency. 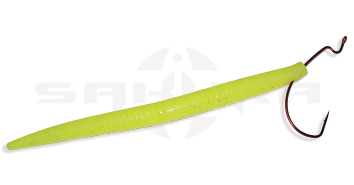 Recommended Hooks: Gamakatsu Worm Offset W314 – W323 – W321. Texposed Rig : The point of the hook is pushed through the body of the lure and remains exposed on the back of the lure. This arrangement is for open water stations or uncongested areas. 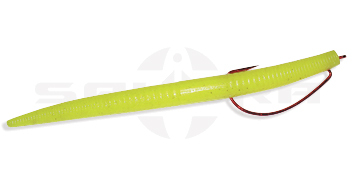 Recommended Hooks: Gamakatsu Worm Offset W314 – W323 – W321. attractive assembly, obtained by pricking the hook in the middle of the lure or “shoulder”. Weighted with a lead or tungsten insert, or used weightless for slow animation or surface, it is best used with a spinning setup . Recommended Hooks: Gamakatsu W39, 318 and 318 Worm weedless, perfect with a Senko or Pro Senko, a venum Tail Biwaa or L16 Koneel Sakura. 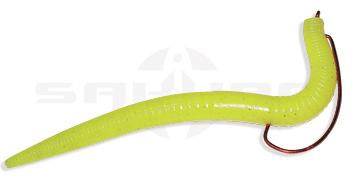 Based on the principle of the Wacky Rig, a jig head is used to accentuate the lure of switching and amplifying the beat of its ends during lifts and falls, in midwater or on the bottom. Hook recommended: Wacky Jack Roll 212 head. This revolutionary assembly, discovered in Japan, gives your lure a realistic fleeting swim. Wacky mounted with a weighted insert, the lure will go to the left or right (depending on the mounting direction) when it prints a slight continuous movement. The L16 Koneel Sakura loaded with a tungsten insert is perfect for this. Recommended Hooks: Gamakatsu Worm 318 and 318 weedless. consisting of a lightweight ball (max 7g) in a Carolina style. Hooks Recommended: Gamakatsu W39, W318 and 318 weedless and all models Offset congested areas. Our favorite lures: Slit Shad Slit Finesse, L16 Koneel, Senko, Shad Shape Worm, Zander K Biwaa, etc. Also called Down Shot Rig or Undershot in different countries, this arrangement allows you to park a lure on a specific area, as long as desired. The basic animation comes down to small tremors and short drawn, alternating breaks, with the weight remaining in contact with the bottom. Tie your hook with a Palomar knot, replay the free end (30 to 60 cm) from top to bottom in the eye of the hook. This process helps keep the tip correctly positioned upward. Double overhand knot in the end and free end-stuck there one of our weights Drop Shot Long Sakura. All soft lures can fit these purposes, we recommend the following lures: Slit Finesse, L16 Koneel 150 (Sakura), and Tail venum Scorpitail (Biwaa) and Kut Tail Worm or pro Senko (Gary Yamamoto). 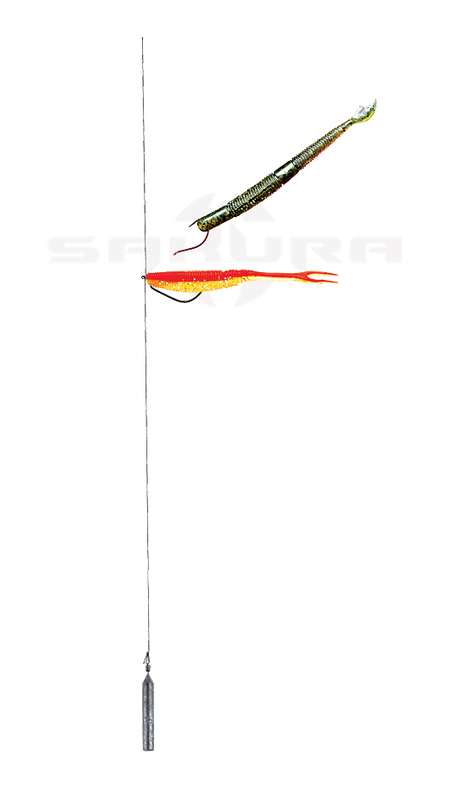 Recommended Hooks: Gamakatsu W39 dive through the nose or wacky and W314 G-lock for anti-snag Texan mounting option.